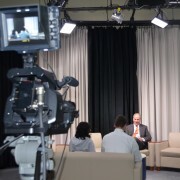 The video production studio enables our students to learn the techniques of HD video through creation, implementation, monitoring equipment and production, and gives them the opportunity to do it all via wireless technology. By year two, we have students running full productions, hosting video sessions, doing interviews, and collaborations with our students and teachers in grades K to 12 as well as school visitors. Our students did a live interview in the studio with a war veteran and discussed his experiences live, in conjunction with our HS students. 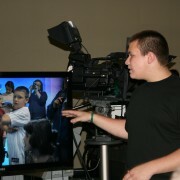 Our studio is also home to the daily HS morning announcements, as well as a wonderful added feature to our elementary and middle school classes for productions of classroom plays, newscasts, and screen shots for an extension to their curriculum.